Kilmore 2 6 Ballynahinch Olympic. Kilmore Rec entertained Ballynahinch Olympic in the 1st round of the Border cup and from the first whistle both teams were on the front foot. Goalmouth action between Ballynahinch Olympic and Kilmore Rec. 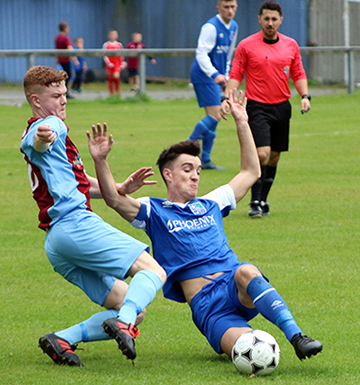 Kilmore sprung the offside trap on 4 minutes but their number 9 James McGivern was quickly closed down by the advancing Olympic Ryan Walsh who bravely blocked the goal bound shot writes Cyril McKinney. On 9 minutes Ballynahinch were awarded a free when the lively Molloy was brought down on the right wing. From the resulting free the ball, Olympic went ahead as the ball found its way to the back post where the Jason Noade was first to react in the scramble and prodded the ball home to give Olympic the lead. 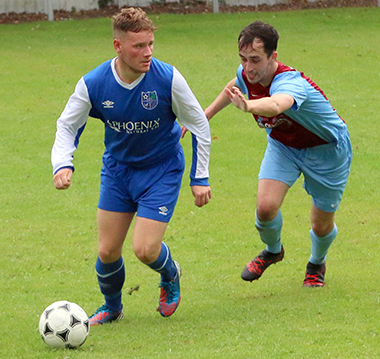 Kilmore Rec were stretched against the determined Ballynahinch Olympic visitors. Kilmore responded immediately and in the space of two minutes their hard working number 7 Thomas Macklin twice had the Olympic keeper saving with his feet but as the half went on both defences were on top as both teams cancelled each other out. The referee had to be alert to rule on many contentious off side decisions. He did well to keep his cards in the pocket as the tackles started to fly in. Kilmore enjoyed a period of dominance without really threatening with good link up play from their two front men Young and McGivern and as the half-time whistle approached on 45 minutes, Kilmore’s McGivern broke through but from a tight angle could only find the outside of the right post and side netting. Within the first 8 minutes of the second half, the game was effectively over as Ballynahinch went 4-0 up. Nathan Jones pounced on 47minutes to calmly slot home and three minutes later Jones fired in a cracking left footed volley to make it 3-0. On 53 minutes Ballynahinch went 4-0 up as Niall Murray finished a great move with a clever finish. Kilmore made changes and brought on McCarthy for the injured McGonagle, McMenamin for McMahon and Stewart was replaced by Stranney. McMenamin got into the game immediately down the left flank and force the Olympic keeper Walsh into a routine save on 56 minutes. A minute later, however, it was 5-0 as Olympic’ Jones completed his hat trick after a great move down the right and received a cross from Molloy. The referee showed his first yellow card to the Kilmore’s McGivern on 61 minutes for a rash tackle, but Kilmore kept pressing forward and were rewarded on 62 minutes with a well-taken goal by Thomas Macklin. Ballynahinch made some changes with McLean replacing Dougan and Lyons coming on from Molloy. Olympic’s James McClean in action with Kilmore’s Eoin McGrattan. On 69 minutes the McGivern sprung the offside trap and lobbed over the advancing keeper only to see his shot drift just wide of the Olympic post. On 75 minutes Ballynahinch made their final substitution with match winner Jones being replaced by McNamara and minutes later went 6-1 up with McLean on the end of another fine move. A rare Kilmore attack ended with a penalty being awarded which was dispatched in style by McMenamin on 87 minutes. As the game entered its final stages, Kilmore’s McCarthy was shown a straight red card for a reckless challenge. Olympic were good value for this win and with Reid and Noade controlling the midfield they had a hard working forward line who were a constant threat and took their chances. Kilmore played well in patches and had some good perfomances from players such as Cheevers at the back, Larkin and McGivern and Young who kept trying up front. 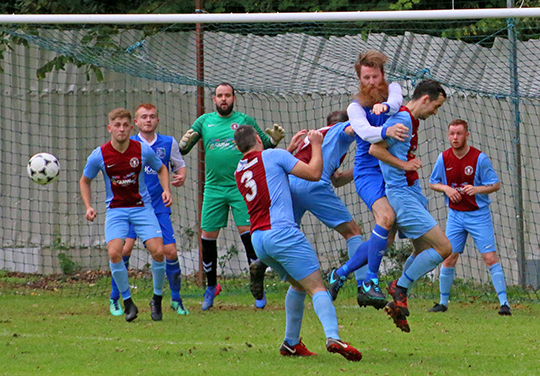 Overall, Ballynahinch Olympic on paper were certainly favourites before the match as they were sixth from the top of the NAFL Premier League whilst Kilmore were from Division One placed seventh. So, Olympic continue their climb up the soccer ladder with another solid performance.